My excitement for Popnovella is more than that which comes with realizing a dream and a concept . . . it is about the people I get to work with. Let me tell you about them. Michael Hill is my equal business partner in this new venture. Michael is one of the most solid and consistent guys I know. I can always count on him and . . . I have been for the last 30 years. Michael and I met in the fourth grade. He was the first real friend I made when my family moved to the California foothills from the San Francisco Bay Area when I was 9. When you are real close to someone for 30 years—you can’t hide anything. You know their weaknesses and strengths as well as you know your own. That is why we work so well together. Michael is a talented musician, a guitar aficionado, a session player and recording artist, a worship leader, and a techno-geek of sorts. We have played together in live scenarios and worship venues in multiple countries over the years. He is Co-Owner of Popnovella as well as a Producer. He is in charge of scoring and sound engineering all our films, working customer service, and a host of other jobs. 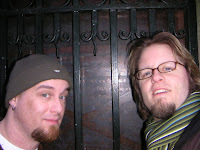 Above is a pic of Michael and me in Ireland outside Bono's house. In fact, if you are in the Nashville area and need to hook up with a monster guitarist and bass player, Michael is your man. He has recorded with a host of talented people from Roby Duke Outside of all of Michael’s entrepreneurial efforts, he is on staff at The People’s Church in Nashville and is involved in production for both their Franklin and Spring Hill campuses. Little known fact about Michael: he can sing opera. Nate Evans is our all around video guy. From filming, to editing and everything in-between Nate is the man. Nate started as an intern at Westwinds working with me a couple of years ago and then I hired him to be on staff. I love his eye. I love his style. When Michael and I decided on the “look” of Popnovella—edgy, raw, a bit unrefined—we knew Nate was the guy to help make us cool. Little known fact about Nate: he almost became a tribal missionary before he found out there wasn’t a Starbucks in the jungles of Papua New Guinea. You can hear from the three of us in the flash intro at Popnovella.